Join us in reaching another 1,000 families with safe water solutions. You can make an immediate and permanent impact on families and children in one of the most underserved areas in the world. 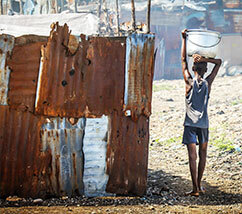 The photos above are from Haiti’s Cité Soleil, considered the “worst slum in the Western Hemisphere”. Water sources here are heavily contaminated with human and animal waste, combined with massive amounts of trash and debris. “People drink water without treatment. They suffer with infections, stomach aches, fevers, vomit, diarrhea and more. While we cannot lift these children and their families out of poverty, we can deliver the foundation to a healthier, more productive life… clean water. An in-home use bio-sand filtration system that keeps healthy minerals, while filtering out 100% of parasites and up to 100% of other toxicants. Community hygiene education and training. Follow-up monitoring, to ensure the cycle of waterborne illness is broken. No other organization is better positioned to address the water crisis facing Cité Soleil than Pure Water for the World. We have spent years earning the trust and respect of this community, through successful work in schools, clinics and hospitals. Now we have the opportunity to bring clean water directly into their homes. By extending clean water and hygiene practices into homes, families will have access to safe water all of the time, supporting the elimination of waterborne illnesses. Together, we will give Cité Soleil families and children the opportunity for a healthier, productive, more hopeful future. Cholera, a disease preventable with safe water and hygiene practices, has killed >10,000 people & sickened >1,000,000 since its introduction in 2010. Objective: Reduce disease caused by unsafe water and hygiene practices. Install permanent, bio-sand water filters in homes. 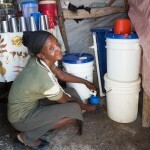 Educate families about waterborne diseases, safe hygiene practices and proper use of the water filter tool. Follow-up with volunteer community agents and families served regularly, to ensure correct and effective use of the programs and practices. Random sample demonstrated filters and education creating measurable change (10% of homes served).